This item will be available sometime in the future. As soon as we have a fairly accurate arrival date, we'll open this item up for pre-orders. 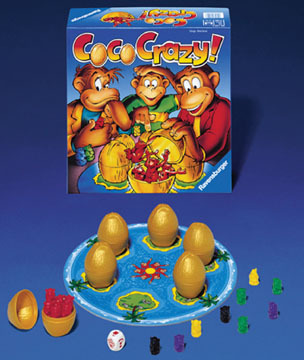 Do you remember which coconut contains the blue monkeys? How about the yellow ones? Roll the die in this game of constant coconut swapping and memory. When picking a coconut, try not to reveal your discovery to the other players! Monkey around enough to collect all 6 colors first and win!